Drinkwell Avalon Replacement Charcoal Filters are for use with the Drinkwell Avalon Pet Fountain and are designed to keep your pet’s water tasting clean and fresh. Each filter features a duo-density polyester pad that catches hair and debris, which the charcoal removes bad tastes and odours from the water making it more appealing to drink. 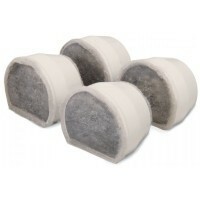 Pack of 4 replacement Charcoal Filters.